CHARLESTON, W.Va. (AP) — Recovery teams working before dawn Tuesday finished the grim task of recovering the last of 29 West Virginia miners killed in the nation's worst coal mining disaster in decades. Jama Jarrett with the state Office of Miners' Health Safety and Training said the last bodies were removed from deep inside the sprawling mine around 2 a.m. or 3 a.m. Tuesday and were being sent to the state medical examiner for autopsies. Recovery efforts had been stalled in previous days by volatile gases, but teams entered Monday after the tunnels were ventilated. Massey Energy CEO Don Blankenship said the recovery means the company and others can now focus on the task of trying to determine what caused the worst U.S. coal mining disaster since 1970. Jarrett said investigators had not entered the mine by early Tuesday morning. The team of inspectors from the Mine Safety and Health Administration briefed Secretary of Labor Hilda Solis and MSHA director Joe Main at the Upper Big Branch mine Monday. Richmond, Va.-based Massey has been under scrutiny for a string of safety violations at the mine, though Blankenship has defended the company's record and disputed accusations that he puts profits ahead of safety. West Virginia Gov. Joe Manchin is calling for greater enforcement at state mines that have similar problems. Manchin is to attend an emergency meeting Tuesday of a state board charged with writing mine safety regulations. The state has nearly 200 underground coal mines. New York state's comptroller and a pension fund adviser called for Blankenship's resignation immediately as chairman of Massey's board. Comptroller Thomas DiNapoli, trustee of a retirement fund holding more than 300,000 shares of Massey stock worth $14 million, said the company failed to adequately manage risks at the mine. A similar challenge came in a letter to Massey from William Patterson, executive director of the Washington, D.C.-based CtW Investment Group, which works with union pension funds. Mourning continued Monday exactly a week after the explosion, with the ceremony at the state Capitol and a moment of silence at 3:30 p.m. President Barack Obama ordered all U.S. flags in the state flown at half-staff until sunset Sunday. Virginia Gov. Bob McDonnell also asked people in his state to observe the moment of silence. 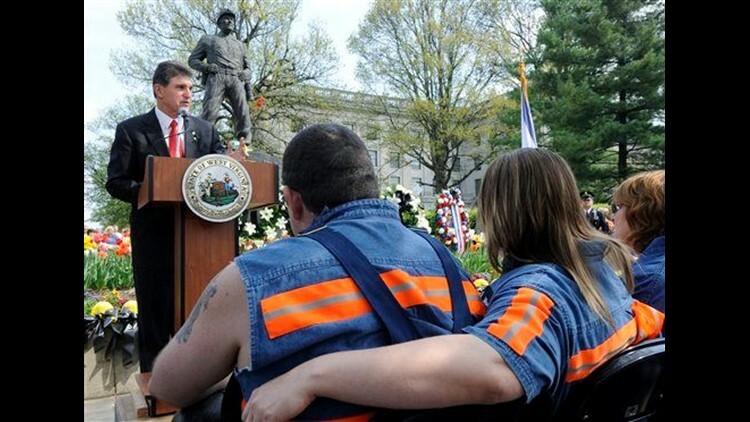 He restored $750,000 in funding for mine safety inspections in Virginia to the state's strained budget, saying the tragedy in West Virginia was a wake-up call.